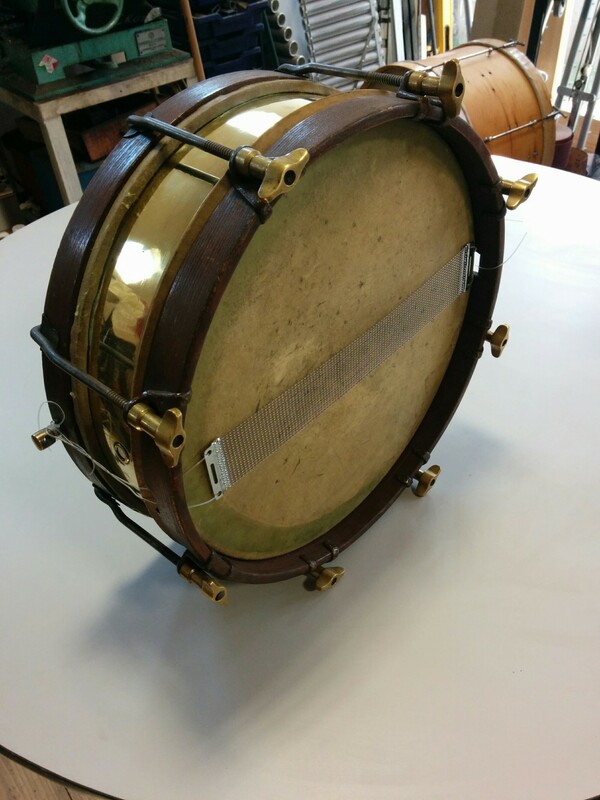 A lovely little snare drum came in for me to look at. It needs new heads, and snare mechanism. 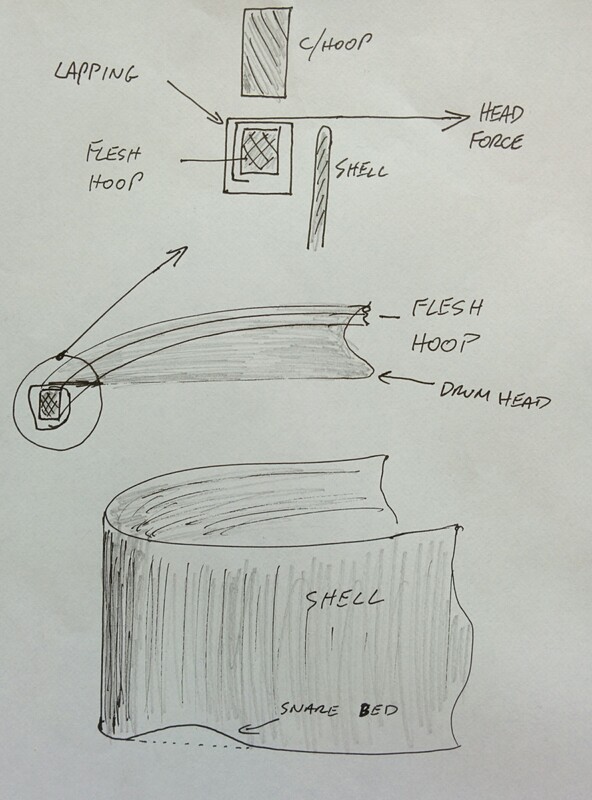 The diagram below names the three components: how the head, lapped onto its flesh hoop, goes over the shell and is tuned by the counter hoop. 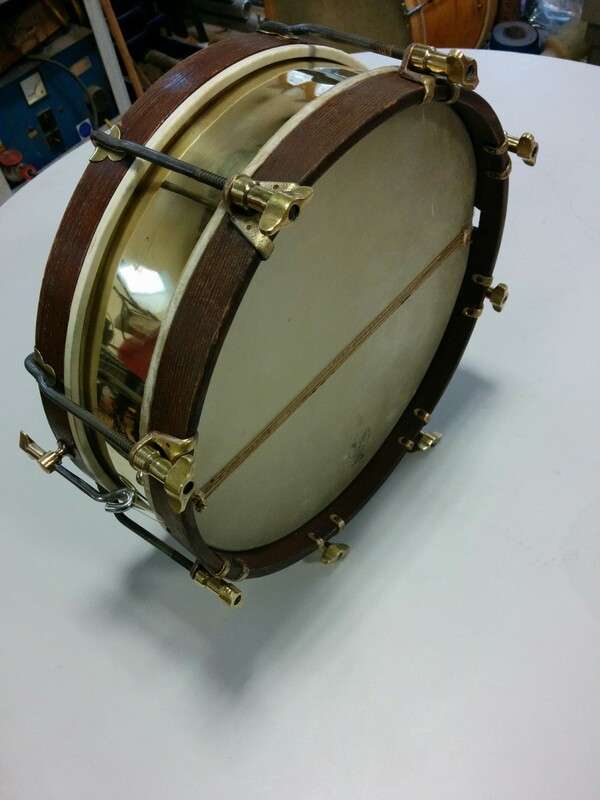 When I stripped the drum, the shell was in upside down, so the snare bed was against the batter head. The snare bed is simply a section of the bearing edge that is cut away so that that section of the head is lower than the rest. This enables the snares to lie flat against the head. At the top of the diagram above, is an enlargement in cross section view, showing how the head is wrapped all the way around the flesh hoop. It also shows the direction of force applied to the flesh hoop by the head: the head is pulling the flesh hoop in towards the centre of the drum, and because of the lapping the force is also pulling the outside edge upwards, thus twisting the flesh hoop. The problem with wooden counter hoops is that this force exceeds the strength of the wood, and does bend them out of shape; being hygroscopic they then “set” in this new shape and become conical. This drum had two twisted flesh hoops, which both makes it hard to lap the heads on evenly, but were also squeezing against the shell and constricting movement of the head. All parts cleaned up and ready to go. There is a very thin calf snare head, and a thicker hand skived goat head on the batter side. 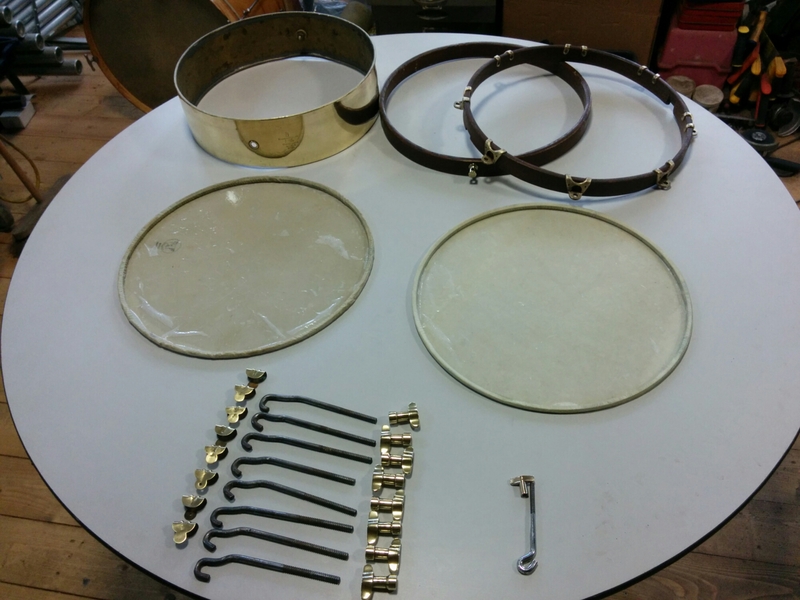 After the heads had dried, I made new gut snare snares. These jobs are always pleasing, but there are few times that I am really tempted to keep the instrument – it sounds incredible, so earthy! I am the owner of this Potter snare drum, it was an eBay purchase and needed a lot of attention. It now has new calf and goat heads and a working snare mechanism which has been added in the style of the other fittings. The drum sounds absolutely amazing with its new lease of life, Paul has done a fantastic job!